To be fair, I don't often watch Key & Peele on Comedy Central; however, even though the trailers for Keanu looked stupid, the screening was in my neighborhood, so I decided to attend. Half the people seemed to think this movie was genius and the other half thought it was ridiculously dumb - I unfortunately fall into that latter half. The movie did have a cohesive plot: Rell (Jordan Peele) has just been dumped, and he's feeling a bit depressed. There's a noise by his front door, and when he opens it, a tiny kitten - whom he later names Keanu - is waiting for him. However, he doesn't know that the kitten used to belong to a drug lord, and that the men who killed him now want the kitten back; when he gets home one day, his place has been ransacked, and the kitten is gone. His friend Clarence (Keegan-Michael Key) agrees to help him to get Keanu back, and the path they take to find the kitten is an arduous one. I think the only joke I laughed at during this one was one of Key's - he's comparing his upbringing to that of Rell's (Peele's) and he says something like "Um, no, I know NYC is tough but I went to Detroit Public Schools!" - which of course got a good laugh out of this Detroit audience, and Key actually is from Detroit, too. 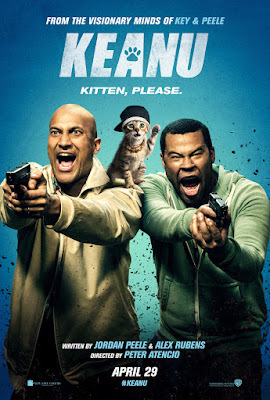 The film has a good cast besides Key and Peele, too - Luiz Guzman also has a small role, as another gangster, and Nia Long too, as someone who works with Cheddar (Method Man), another drug lord who has Key and Peele's characters working for him in order to get Keanu back. Kitten, please ... No, don't see this movie. The only exception I can think of is if you've seen all of their skits and the TV show and really enjoy the humor; the audience seemed to be laughing a good amount during the film but I only laughed at maybe one or two jokes. I was sitting with another screening friend, and he turned to me and said "That movie was so dumb" as we exited the theater, so I know I'm not the only one who disliked the movie, as well. Keanu gets the dubious distinction of being only my second "No" movie of the year (the first one being Gods of Egypt, two months ago), but for me it's a hard "pass" and one I won't be rewatching in the future. Keanu is in theaters today, April 29th, and is rated R with a runtime of 98 minutes. 1.5 stars out of 5.